Heat oven to 400°F. Grease bottoms only of 12 regular-size muffin cups with shortening or place paper baking cup in each. In large bowl, beat eggs lightly with fork. Stir in milk and oil. In medium bowl, stir together flour, sugar, baking powder and salt. With fork or pastry blender, cut in peanut butter until mixture looks like meal or coarse flour. Add dry ingredients to wet mixture; stir just until dry ingredients are moistened. (Remember, no extra strokes to avoid toughness and tunnels.) Spoon half of batter evenly into muffin cups, filling each about one-third full. Spoon 1 teaspoon jelly onto batter in each cup. Divide remaining batter evenly into muffin cups. Wipe any spilled batter from pan. Bake 20 minutes. Remove from oven to cooling rack. Loosen muffins from cups; remove muffins with spatula. Don't over mix the batter, stir just until the dry ingredients are combined for tender muffins. Grease only the bottom of muffin cups; muffins have better shape when sides are not greased. 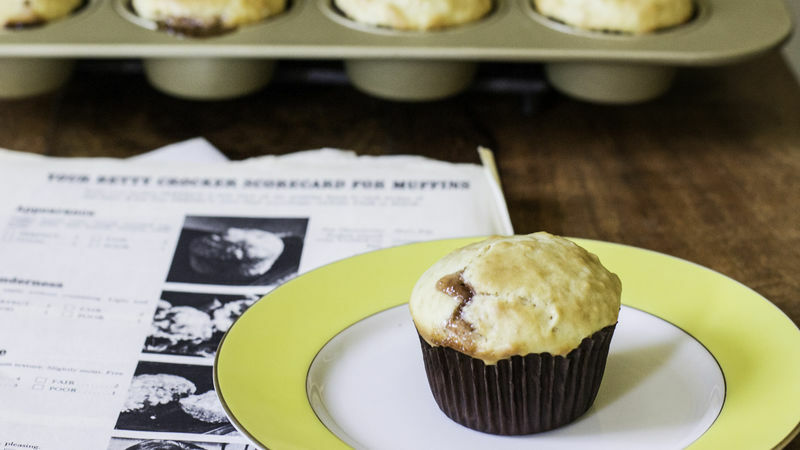 Choose shiny pans to give muffins a delicately browned and tender crust. Always serve muffins piping hot!